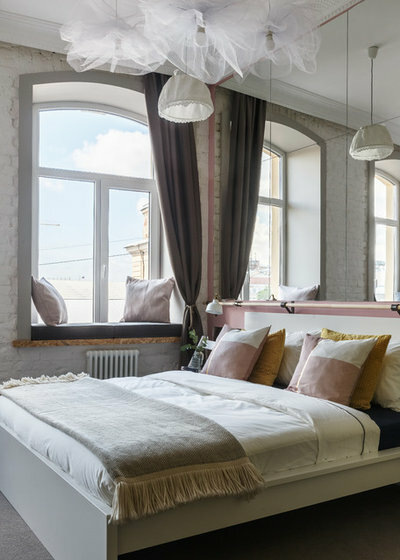 The owners of this apartment, a young couple, recently moved to Moscow, leaving behind their shared apartment in the centre of Saint Petersburg, Russia. 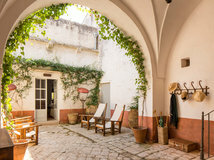 However, they still wanted an interesting place to stay when visiting their hometown, where they would be able to host relatives and friends. 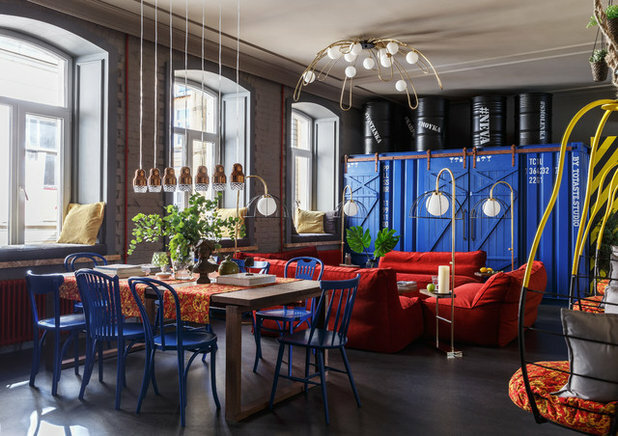 So they bought the rest of their shared apartment in Saint Petersburg from their former flatmates, and asked designers Max Zhukov and Victor Shtefan to transform it into a colourful loft. 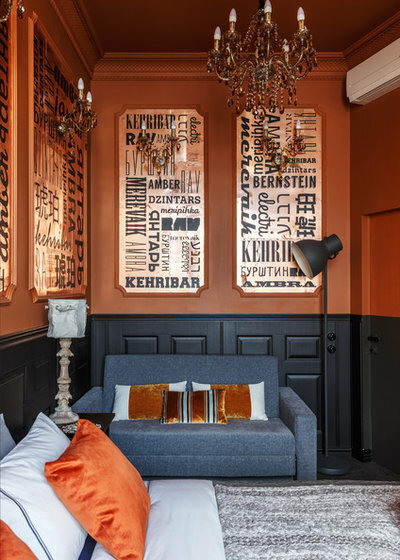 The couple gravitated towards a design that celebrates Saint Petersburg and Russian living, with themed rooms modelled on some of the city’s most famous attractions. 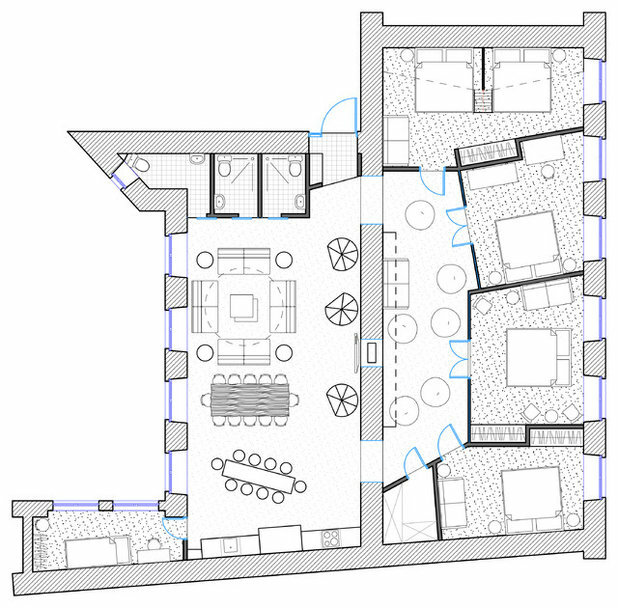 It turned out that there was only one load-bearing wall in the apartment – the wall pictured in the centre of this floor plan. It helped separate the public areas from the quieter sleeping zones. 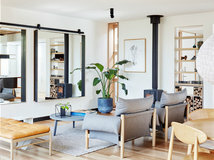 The designers put in other partitions as needed, though as they kept the kitchen and bathrooms in their original locations, the permit process for the renovation went smoothly. The owners needed a large, open common space, and as many beds as possible without compromising comfort. 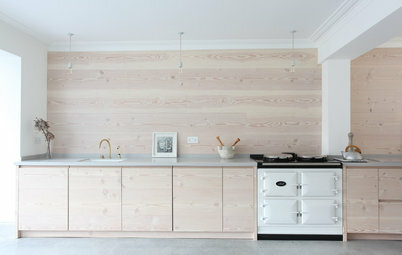 What they achieved was a combined kitchen, living room and bar, as well as five bedrooms. Now 16 people can comfortably stay here overnight, and two additional guests can sleep on the sofa bed if need be. 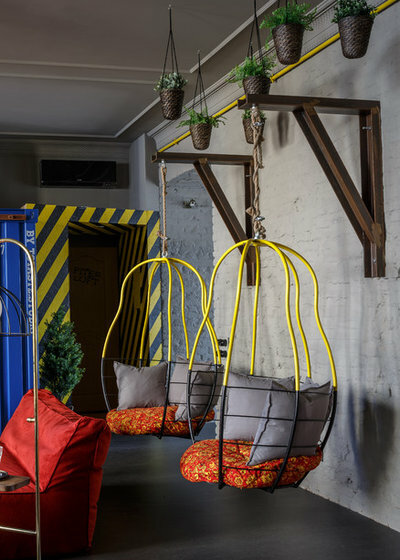 “The owners themselves chose Saint Petersburg as the main theme in order to show their guests the best their beloved city can offer, with a good dose of humour, kitsch and the industrial decor we love,” says Zhukov. 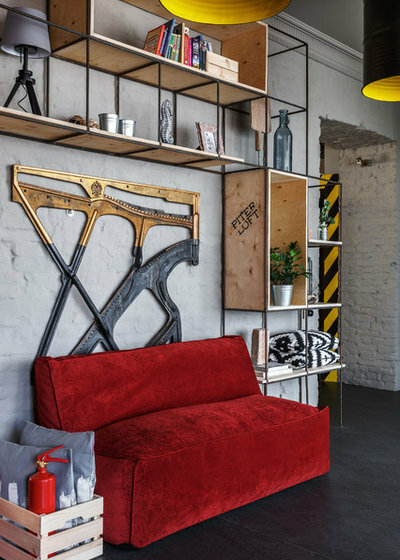 The living room was painted grey – a reference to Saint Petersburg’s typical grey skies – but bright accents and the generous proportions of the red sofas give the room a plush, playful feel. This room is modelled on Saint Isaac’s Square and features a dome-shaped chandelier and floor lamps that recall the cathedral’s architecture. 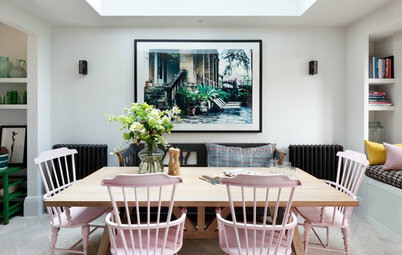 There is plenty of room for a big group of friends to gather around the dining table, on the soft sofas or in the matryoshka armchairs – whose shapes were inspired by nesting matryoshka Russian dolls – that almost look like they’re floating in air. 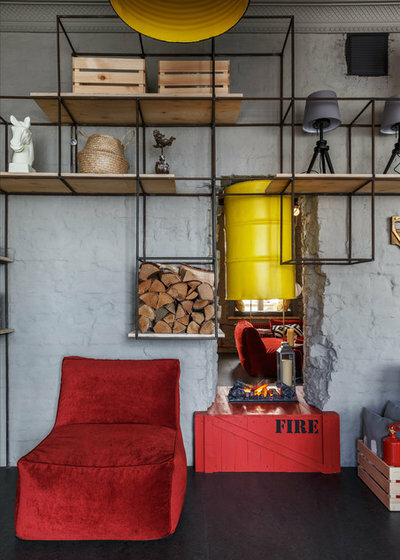 A themed interior demands fitting furniture, lighting and decor. 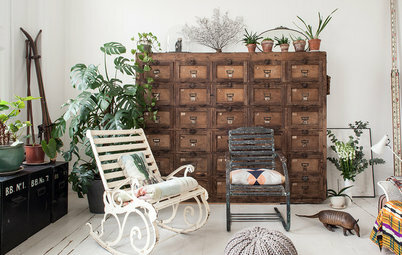 As many of these pieces are difficult to find, much of the furniture in the home was custom-made. 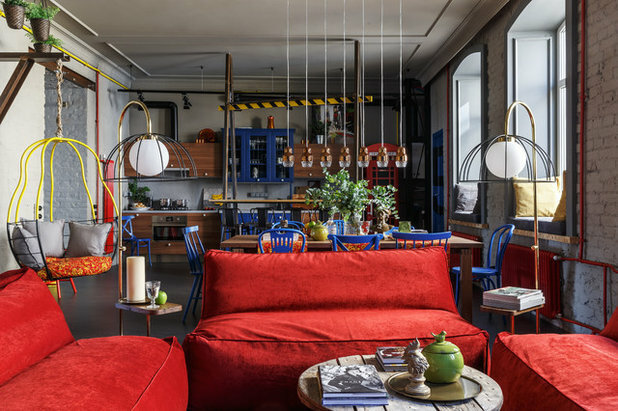 In this space, the chandelier, floor lamps, sofas, matryoshka armchairs, bookcase, hutch cabinet and bar in the kitchen were all made according to the designers’ sketches. 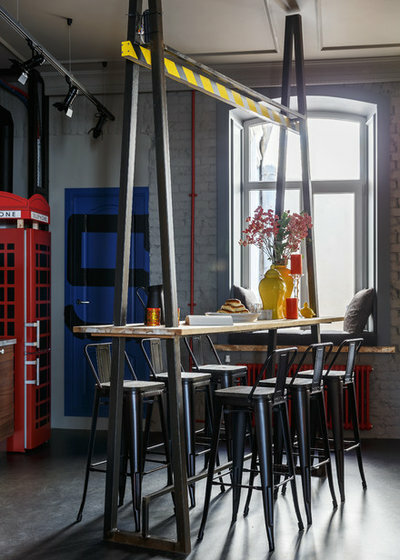 The Fedora lights, pictured here above the table, were designed by Dima Loginoff for Axolight. The interior is not only about Saint Petersburg, but also about Russia more broadly. The designers wanted to showcase Russian lifestyle, so they styled the kitchen to resemble a dacha – the quintessential Russian holiday home. Somewhere in every dacha is an old hutch, or cabinet, that belonged to someone’s grandmother, so the designers recreated this ubiquitous symbol of summer living here. 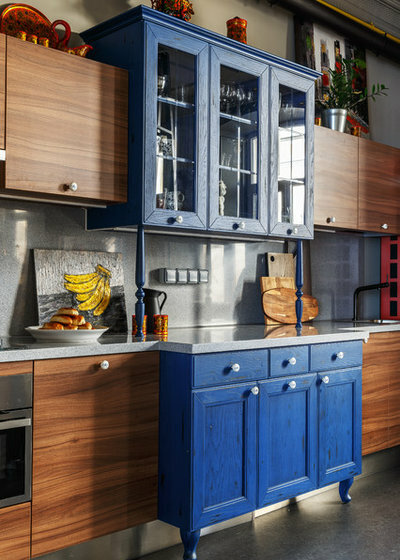 Its bright blue matches the overall design, while the rest of the cabinets were designed to be deliberately simple in comparison to create a contrast. The acrylic stone benchtop ties all of the elements together. The red telephone booth in the corner is actually a refrigerator. Black film imitates glass, and the top of the booth was custom-made by a sign maker. The large blue shipping container houses bathrooms. “Initially, there was only one bathroom – and it was just a room with a toilet – though it did have a window,” says Shtefan. “We added a blue container to it. 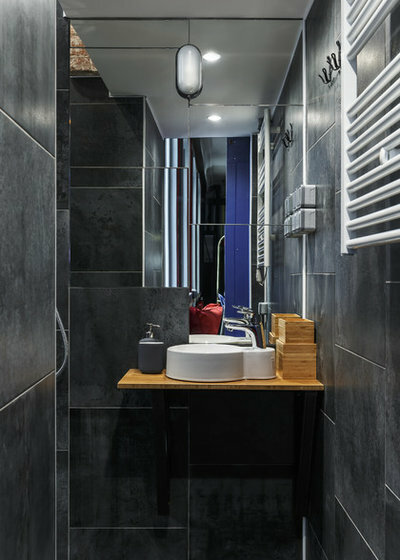 This allowed us to add a bright, iconic, industrial element that also serves to conceal the bathrooms.” The designers also worked in two additional bathrooms and added showers to all three. 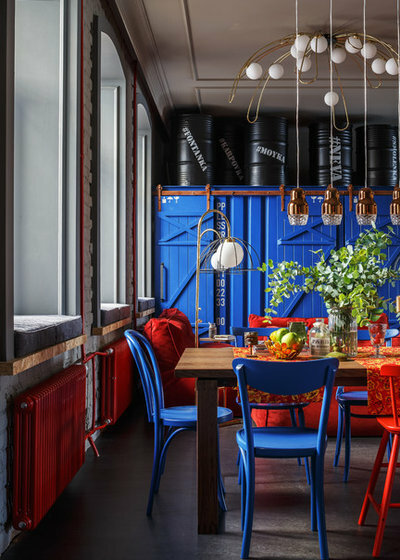 The barrels above the shipping-container bathrooms also contribute to the Saint Petersburg theme. Each is labeled with the name of a local river or canal, and legend has it that each barrel contains water from its respective river. Each bathroom is painted a different colour and the designers drew on large mirrors to make these tiny rooms appear larger. 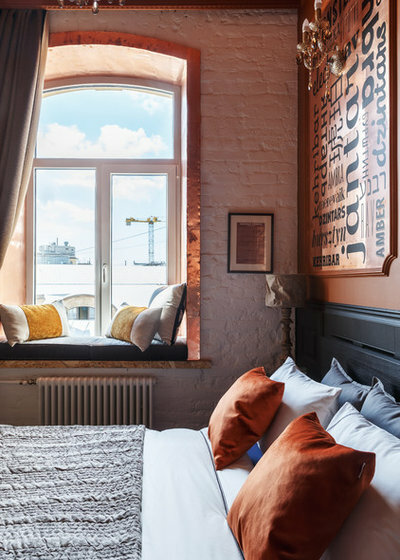 Just off the living room is the so-called Petrovsky Gardens bedroom. This room occupies what was once a sun room – a very small, narrow space that caused the designers a lot of grief. Moving into the hallway, which doubles as a library, the barrels seen hanging from the ceiling are disguised pendant lights. 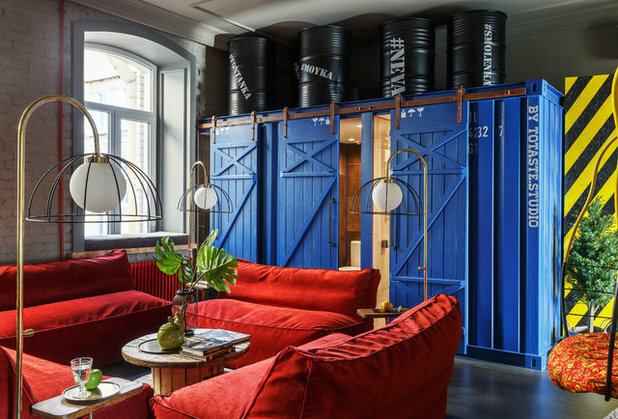 These lights echo the water barrels above the shipping-container bathrooms and are in keeping with the apartment’s overall themed style. 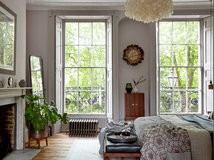 The bedrooms opposite the combined hallway and library are separated by frosted glass partitions that let natural light into the reading space. The doors are flush and match the rest of the glass wall, so they do not draw attention. As was the case in many Russian communal apartments, an old, out-of-tune upright piano once stood here. It needed to be dismantled and all that now remains is its heavy cast-iron frame. The building has no elevator and no-one wanted to lug the relic down the stairs, so the designers decided to leave it in place to serve as a piece of decor and a little slice of history. Modelled after a museum ship, the ‘Aurora’ bedroom was designed to have two ‘decks’. 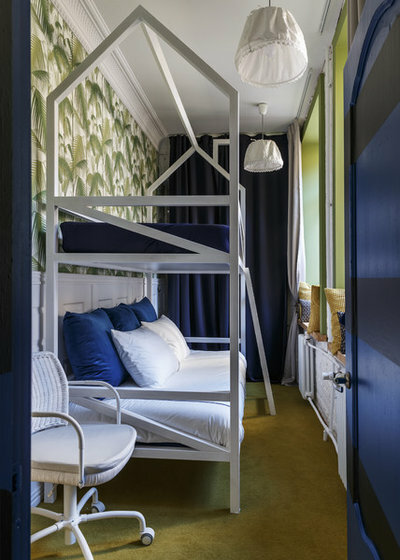 This bedroom is a favourite with children (and with adults who remember childhood dreams of sleeping in bunk beds). 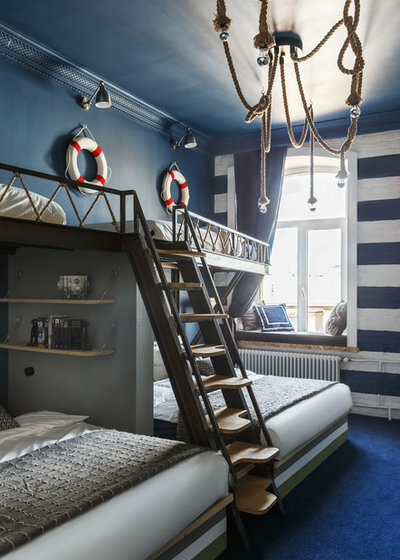 The ropes, life-saving rings, and blue floor reinforce the nautical theme. 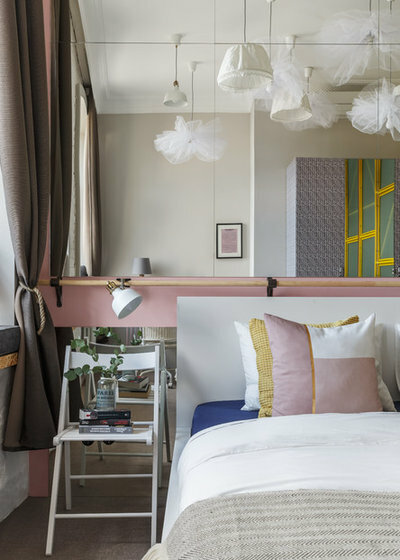 By contrast, in the ‘Ballet’ bedroom translucent tutus hang from the ceiling and a ballet barre is mounted to the wall. Right behind it is a huge mirror that seems to double the size of the room. 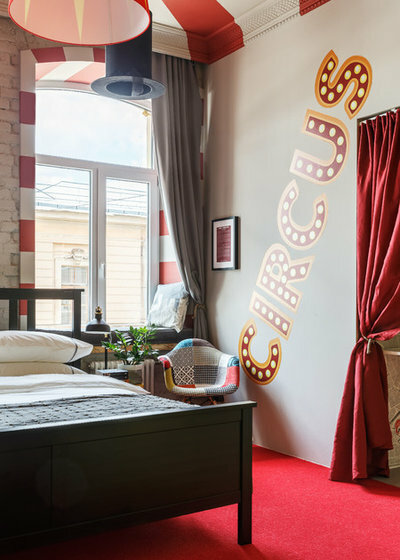 It feels like the ‘Ciniselli Circus’ bedroom is literally under the big top, thanks to its striped ceiling, velvet curtains and red carpet. 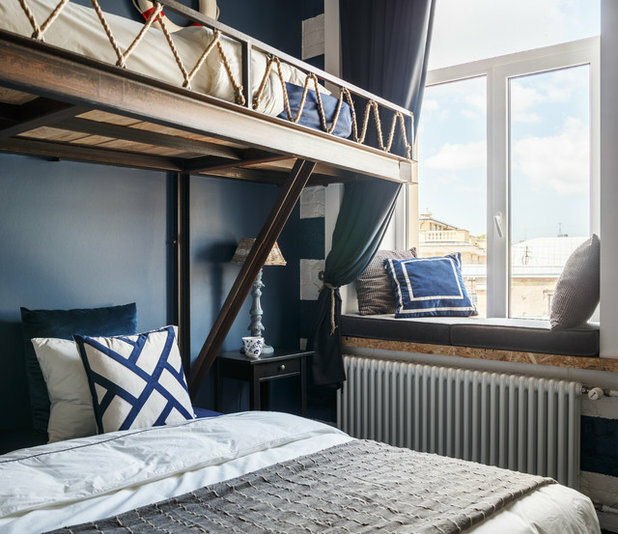 The room’s real-life inspiration is not far from the apartment. 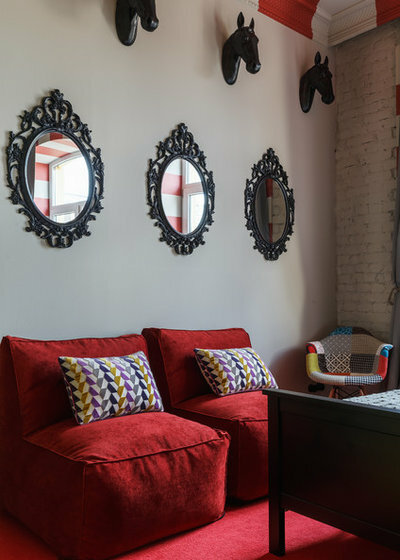 Here, the mirrors and wall-mounted horse heads are from Ikea, while the lamp shades were custom-made. 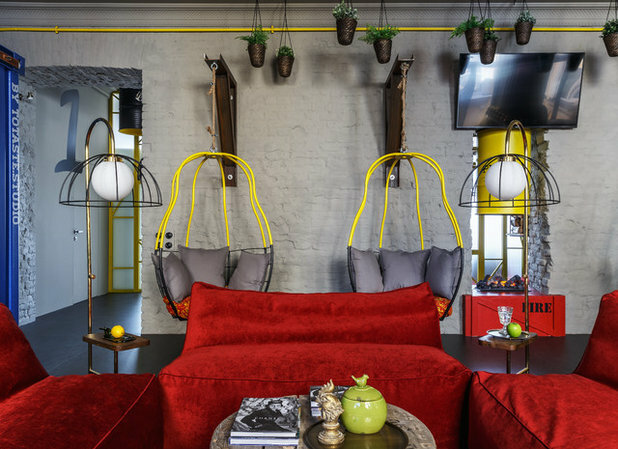 The lampshades are made of denim and deep, inky hues contrast the amber tones in this sleeping space. Each room also contains an information plaque like the one pictured here next to the window, which gives a brief history of the place or monument that inspired the respective decor. What tickles your fancy in this home? 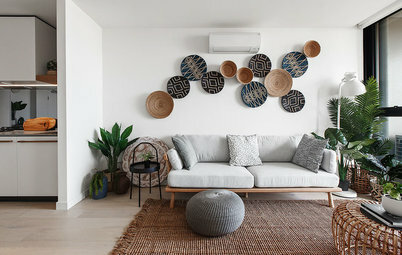 Tell us in the Comments, save the images and if you enjoyed reading about this apartment, like this story. Join the conversation. Wow, it is such a fantastic space! I love it. 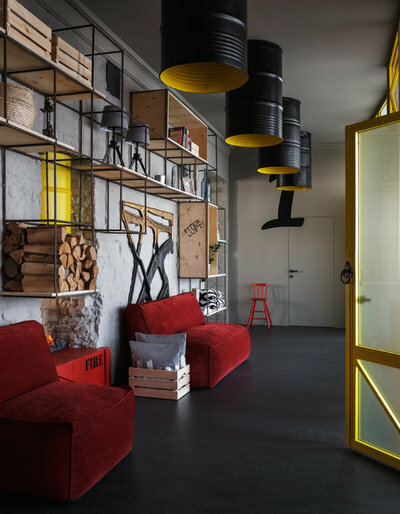 Great use of colour, very creative and well put together spaces. Decorating Help! My Home Is a Blank Canvas. Where Do I Start? 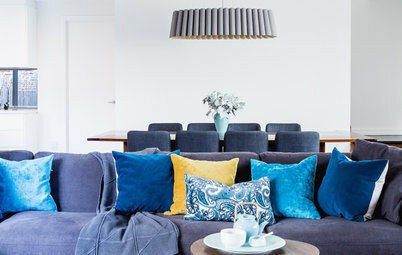 You've moved in and... what now? 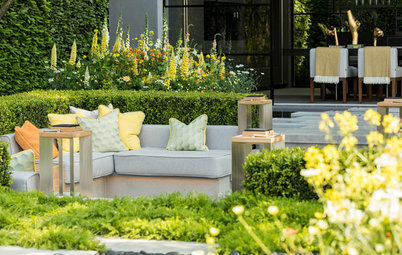 How do you transform a brand-new home into a warm, welcoming retreat?